CLESeminars.com provides Bar Associations of all sizes with Continuing Legal Education webinars presented by some of the country’s best-known experts. CLESeminars.com provides lawyers with continuing legal education webinars teaching practical skills they can immediately put to work in their practices. CLESeminars.com gives select presenters access to its network of continuing legal education partners to extend the reach of their presentations. David Danto’s interview regarding Lume Cube’s new portable video conferencing from CES 2019. Lume Cube’s lighting would be appropriate for distance learning and e-learning applications. See out previous post for more details about Lume Cube’s new offerings. Litra produces professional-grade video lighting products targeted at the “adventure video” market. Due to their compact nature and brightness however, Litra’s products are well-suited for the distance learning/e-learning market. Prices range from $89.95-$219.95. A wide-range of accessories are also available. Lume Cube describes its AIR LED video lights as “the smallest, lightest, most compact professional lighting solution on the market.” The portable lights feature: waterproof design magnetic & tripod mounting options wireless control a range of diffusors Prices start at $69.95 each. Bundles are available that bring the per light cost down slightly. On Monday, November 26th, the American Bar Association is once again running its Cyber Monday Sale. Twitter appears to have disabled its pinpoint geographical search capability, and severely limited its other geographic search capablities. Some less precise geographic search capabilities do still remain. Google is shutting down it’s Google+ (Google Plus) social networking site. Google is shutting down its social networking site after “reportedly failing to publicly disclose a security bug affecting hundreds of thousands of accounts on the service,” (according to CNN). 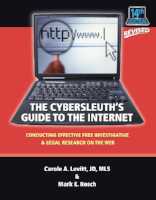 The popular Internet research manual, The Cybersleuth’s Guide to the Internet: Conducting Effective Investigative and Background Research on the Web has been updated to a new 14th edition. Did Google mean to take away the ability to turn off “Instant Predictions” in search? Or did it just get lost in the last update of the Chrome browser? In a blog post, Google announced that Gmail users can now receive email attachments up to 50MB in size. Google has announced that Gmail will stop working on versions of Google’s Chrome browser older than v53 at the end of 2017. Anyone using public wi-fi hotspots to connect to the Internet should be concerned about the security and privacy of the information they are sending back and forth over those connections. Google is apparently discontinuing the public “Hangouts On Air” feature. Hangouts On Air allowed users to broadcast a video stream (lecture, presentation, performance, or other event) and make it accessible to anyone with the URL. Public streaming of events will still be available via Google’s YouTube Live feature. After many years of hiding the search page where you could search Facebook for a user by name without being logged into an account, Facebook has finally killed the feature off. Google has completely killed off access to its old BlogSearch database. The integration of Blog results into NewsSearch results continues to be sub-par. Bench Reporter site offers searchable database of California county courts’ tentative rulings. Google Translate adds 13 more languages. Now recognizes 103 languages. Learn how to search caselaw and articles at Google Scholar without leaving the web page your already on – with the Google Scholar Button. Los Angeles County Civil Court dockets can now be searched by name (party, attorney, and judge) for free, via Plainsite.org. Casemaker internet legal research database offers many new features that have not yet been added to their official online User Guide. eBlocker is launching a new Internet surfing cloaking device that promises to hide much of the identifying information your browsing sessions share with the Web sites you visit. It is currently available for pre-order at a 50% discount. The U.S. Supreme Court does not post its briefs at their site, AND also fails to provide information on where to find Supreme Court briefs for free. New York Times article details how IRS agent Gary L. Alford used his online searching skills to correctly identify the previously-anonymous, “nearly-mythical leader” of the illicit online marketplace Silk Road – Ross W. Ulbricht. Google has crippled yet another of it’s search filters/features. This time it’s the location feature. TransUnion’s TLOxp investigative research and public record database is increasing its fees, instituting a minimum monthly spend (akin to a subscription fee), and requiring all subscribers to undergo a site visit of their physical office location. Yahoo has signed a deal to retrieve some of its web search, image search, and resultant advertising from Google. Harvard Law School teams with Ravel law to digitize Library of case law to make it available to search for free online. In an interview with the Lawyerist Podcast’s Sam Glover, Carole Levitt and Mark Rosch share some of their favorite Internet search tips and “secret” sources. TLOxp to launch Relationship Report comparing assets (real property, vehicles) of two individuals (people). LexisNexis is offering to match Loislaw customers’ subscription price for “equivalent information” in a Lexis Advance subscription in the wake of Fastcase’s acquisition of Loislaw from Wolters Kluwer. Fastcase acquires Loislaw from Wolters Kluwer. Google’s Events from Gmail feature comes to Google Apps for Work accounts. The contents of journals, magazines, and other periodicals in the ProQuest database are now discoverable in Google Scholar searches. Yahoo has emulated the way Google hides access to cached versions of web pages in its search results. Ancestry.com is offering free access to a new database U.S. Wills and Probate records. The Fastcase legal research database launches its first redesign since 2003 – Fastcase Version 7. Official resources for criminal history and criminal records search resources – from state police agencies, courts, and other law enforcement entities. Author/speaker Carole Levitt has been recognized by the American Bar Association’s Law Technology Today publication as one of the Women You Need to Know: In Law and Technology. Reports of Judd Nelson and/or Eddie Murphy’s death are incorrect. Neither Judd Nelson nor Eddie Murphy are dead. Updated November 2014 and December 2010. People never learn to check sources. Microsoft is replacing it’s once market-leading Web browser Internet Explorer. Starting with the release of Windows 10, a new browser, currently code-named “Project Spartan” will be the default browser. Lawyers must keep legal ethics concerns (and responsibilities) in mind when considering cloud computing solutions for their law firms’ and clients’ information. Keep up to date with new programs in our email newsletter.